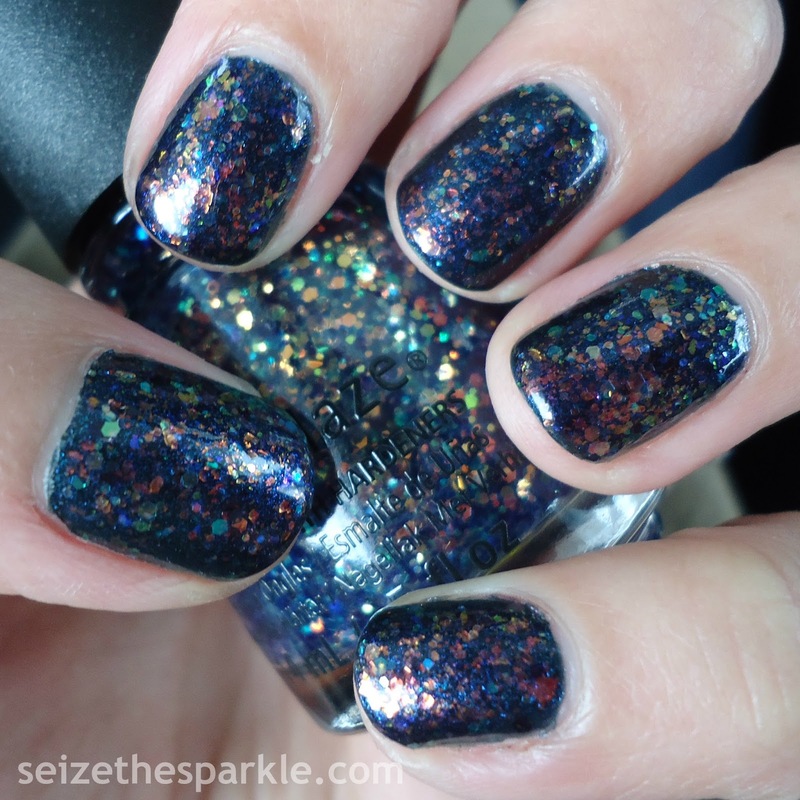 When I ordered Zoya Muse, I was well aware that she was the blue sister to Binx. But I can't really say that I thought much about layering the two of them together. Or creating a jelly glitter sandwich with Paloma. But that's what this turned into! 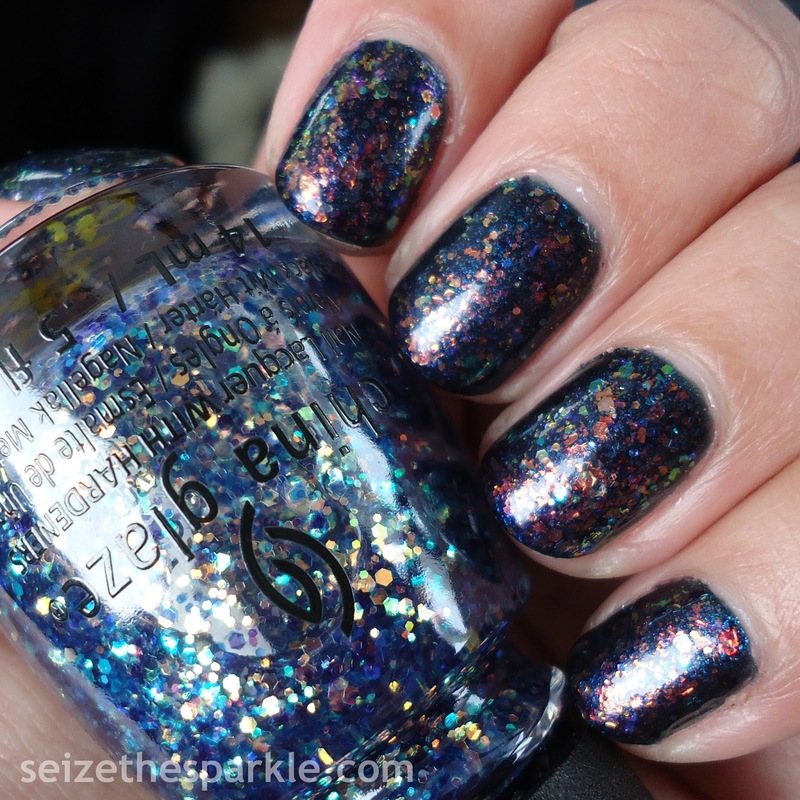 Both Muse and Binx contain translucent and opalescent hexagonal glitter. 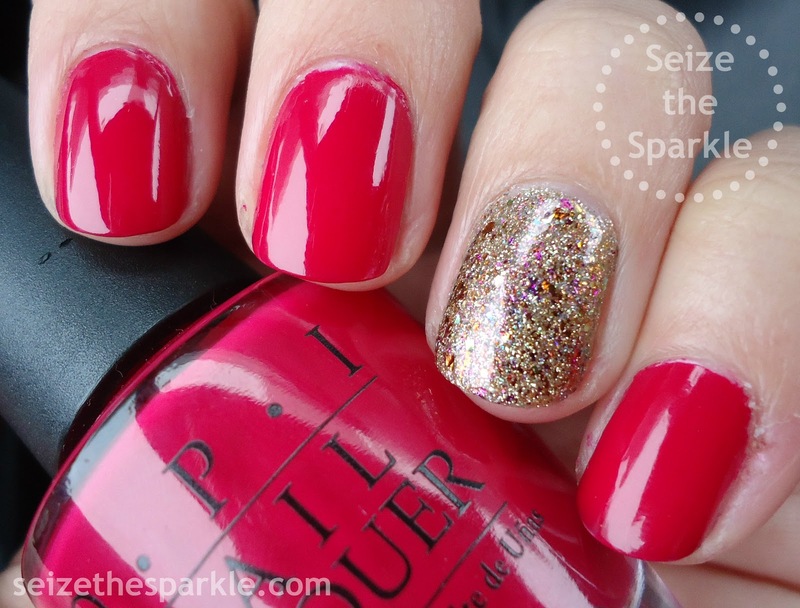 The shades of glitter vary slightly between the two because of the different base coats. 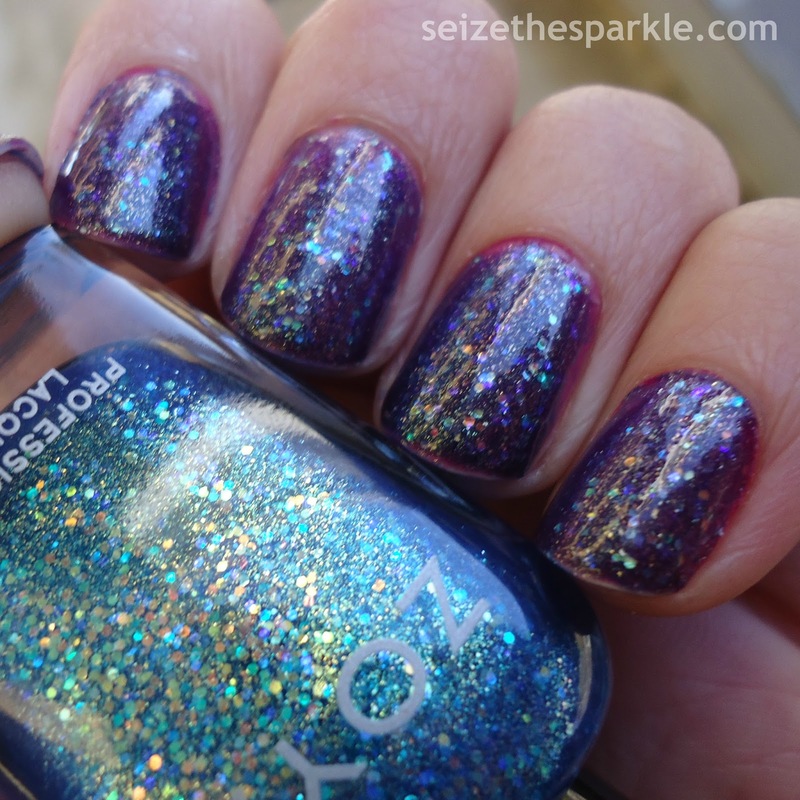 Layer a coat of Zoya Paloma on top and that glitter turns a smidge warmer. All in all, I'm really pleased with how this turned out. 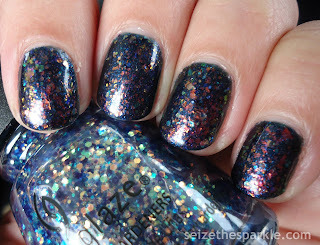 It makes we want to try a similar layering with some of the other Zoya jellies in my collection! So far, everything is going awesome with the new job, and don't worry, it's not like I haven't been painting my nails. My problem has been figuring out when and where to take pictures. But I'm working on it! So, when I have that all settled and I'm a little more used to my schedule, the posting will probably return to normal! For now... it's been a good weekend so far. Got a little cleaning done today, more cleaning for tomorrow, and hopefully we'll be able to get outside if the weather is nice. All in all, I'm so ready for Spring. And I know I can't be the only one!!! It might seem a little odd to be posting this in February, but there's a pretty good reason behind that, I promise. I actually sat down to write this post a few times and recent events have actually allowed it all to flow a little bit better! No, I was busy working on making my biggest Resolution come to fruition. It was a search that actually started out in late September of last year, and got put on hold a little during the holidays, then slammed into full force at the beginning of the year. I've worked at my current job for almost ten years, and it was just time to start looking. Really actively looking. Any of you that have had to do this recently know just how much work goes into it! But I put my little nose to the grindstone and I start my new job the day after Valentine's Day. You know, when I started out with this blog, I just wanted to see if I could do it for an entire year. That year turned into two, and now we're past the three year mark with no plans for quitting anytime soon. No worries about that. I'm sure it will take a little while for me to adjust to a new schedule and a commute and everything, but I'll figure out a way to make it work. That's the thing about change. You adapt. It doesn't matter if you don't want to or you're not prepared. When circumstances around you change, you change with them. When I started this blog in 2013, I was incredibly lost. I'll admit that. Fear and negativity had really crept into my life and changed me. Hardened me. To a point that I didn't recognize myself and neither did anyone else around me. I knew that writing had always been a form of expression for me, and I had a short-lived nail blog prior to Seize the Sparkle. So, I took a big leap of faith and started this blog. Seize the Sparkle was a way to combat the negativity and turn it around. I wanted to get back to myself and find a way to reconnect with everyone and everything around me. All fears aside. I wanted to be brave and have courage. That was three years ago, and I really haven't looked back since, or had any regrets at all. I've come to embrace change and see it as an opportunity, rather than something to be afraid of. With my head in a better place, the more I looked around, the more I started to see chances and opportunities all around me. Ways to be better. Think better. Act better. So, for the first time in a long time, I finally have a direction. And on top of that, I have ideas, goals, and plans that feel like they might actually go somewhere now. It's exciting and refreshing at the same time! Why am I sharing all of this? Well, I guess because if you're reading and feeling the way I felt, I just want you to know that you're not alone. I've been there too. There's nothing wrong with trying to improve yourself. There's no shame in starting over from scratch. And there's no shame in doing it a bunch of times before you get it right! I've tried to define Seize the Sparkle as so many different things over the years, but the truth is, it's the process. They say that life is about the journey, not the destination. 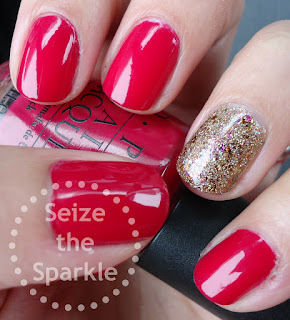 Well, Seize the Sparkle is really my way of capturing that journey. My journey. Thomas Edison once said that "I have not failed. I've just found 10,000 ways that won't work." I've always loved that quote, but I think I have a better understanding of it now. He also said, "Our greatest weakness lies in giving up. The most certain way to succeed is always to try just one more time." If I could wish anything for you in 2016... it would be to keep trying. Even just one more time. And then one more after that. Challenge yourself to actively try. Even if it's something small. I promise, you won't regret it! Are there more things on my Resolutions list? Absolutely! I always make it a goal to do something new and different with the Blog, even if I have no idea what that might be right now. I'd like to win NaNoWriMo 2016. I'd love to get better at planning meals during the week. I also need to organize my 3rd Helmer. The list definitely doesn't stop there for me, and I don't find that I really confine goals or resolutions to the beginning of the year. Do you? I'm curious... What are some of your resolutions? How are they going? Let me know in the comments! 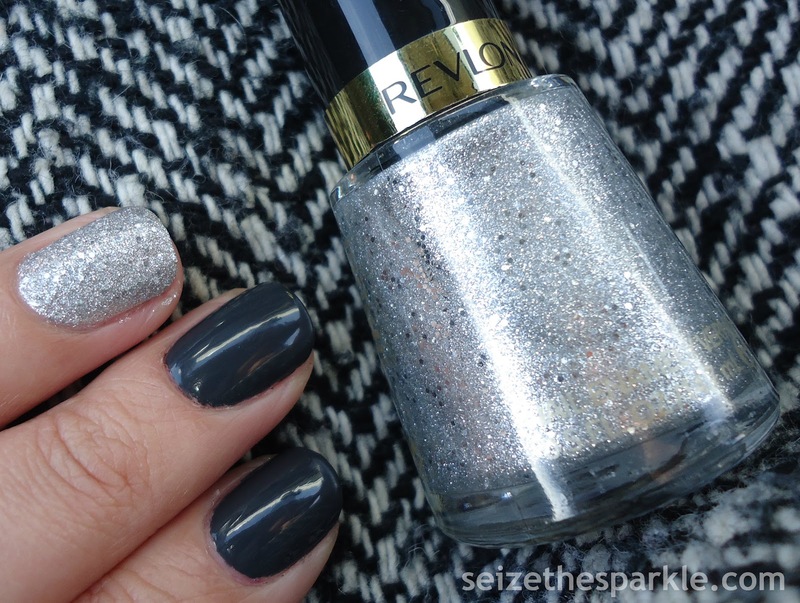 Diamond Texture from Revlon is about the closest thing I've found to a silvery version of Zoya Tomoko. But it's not exaaaaactly what I'm lemming. Don't get me wrong, it's a bright silver, it's textured, and there's a ton of sparkle! But I just wish that it were a little bit lighter. I'm thinking I need a silver with platinum or white gold vibes. But like I said, for now, it's Tomoko's silver... cousin. 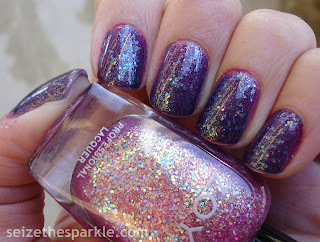 Application was great... Diamond Texture goes on just as easily as my other texture polishes. The formula is slightly thinner than Tomoko, but you still get great coverage with each coat. Most people would probably only need two coats, but I added a third to be make sure I didn't have any patches. 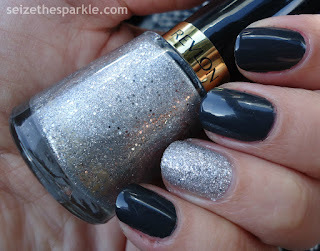 On my other nails, I used China Glaze Out Like a Light, a pretty dark charcoal grey. I really like this shade. I tend to reach for black polish when I don't know what else to wear, and this is a nice alternative to that. Black can sometimes be a little stark and cold. 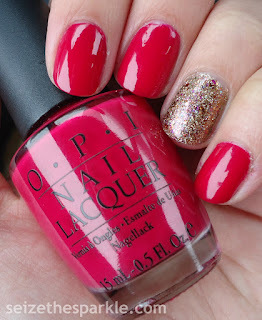 While Out Like a Light is definitely dark, there's a softness to it on my nails. So, I just realized that this is the first time in a while that I don't have any set plans or expectations for the weekend, and I'm actually okay with that! Whatever your plans may be... I hope you have a great Friday, and a fabulous Saturday and Sunday, too!